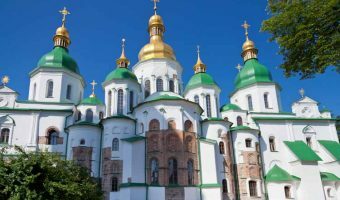 St Michael’s Golden-Domed Monastery is located in Kiev city centre, opposite St Sophia’s Cathedral, and is named after the patron saint of Kiev. It was originally built in the 12th century but destroyed by the Soviets in the 1930s as they believed it lacked any historical or cultural value. In the years after Ukraine gained its independence it was rebuilt and officially reopened in 1999. The cathedral itself boasts a sky blue exterior and is topped with seven bright golden domes. Other buildings of interest at the monastery include the refectory and a magnificent bell tower entrance. Map showing location of St Michael’s Golden-Domed Monastery. The cathedral is very beautiful, both inside and out. There are a few beggars in the area so keep your wits about you. 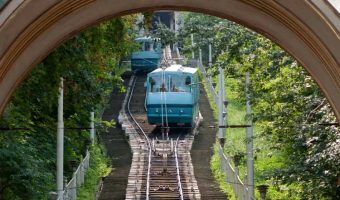 Great way to travel between the city centre and Podil.